Nearly 25 percent of Americans are currently dealing with untreated tooth decay. In addition to causing you physical pain, tooth decay can lead to gum disease, dental abscesses, and even bacteria that travels from the mouth into your bloodstream. While it’s important to get help for your tooth decay as soon as possible, prevention is the best cure when it comes to a healthy mouth. What you eat can help you to get healthy teeth. Read on to learn all about the best foods for your teeth. Along with regular dental cleanings, what you eat can improve your teeth. 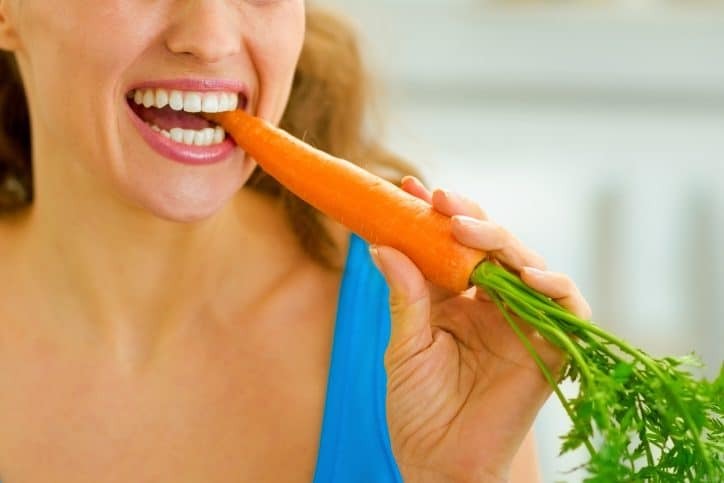 Start by eating more carrots, as this causes your mouth to produce more saliva, lowering your risk of developing a cavity. Also, top salads and eggs with shiitake mushrooms, which contain lentinan. Lentinan helps to fight off plaque, as it contains antibacterial properties that can protect your gum line and the spaces between your teeth. Make sure you’re getting your fill of leafy greens, like spinach or chard and kale. They’re high in Vitamin C, which lowers inflammation and gives red blood cell production in the body a boost. Plus, since they take a while to chew, you’ll see an increase in your saliva production. If you’re looking for an influx of tooth-strengthening calcium without the sugar, opt for a handful of almonds as a snack. Finally, you might be surprised to learn that eating cheese is great for your oral health. That’s because it actually increases pH levels in the mouth, which makes you less likely to deal with tooth decay as you age. In addition to discussing the best foods for teeth, you also need to know which foods to stay away from if you want healthy gums and teeth. First of all, kick your ice-chewing habit, and switch to water instead. The hard texture can damage your enamel and put you at risk for chips and cracks. Also steer clear of acidic foods, like lemons, limes, and grapefruit. Not only will they make any mouth sores you have worse, but they’ll also quickly wear down your enamel. Watch out for sticky, gummy foods like dried fruits and sour candies. While they might be delicious, they easily get lodged in between teeth and in your mouth. Plus, they’re high in sugar, which means you’re at a higher risk for developing cavities. We hope this post has helped to serve as a reminder that eating the best foods for your teeth now — and staying away from ones that could damage them — is a form of preventative dental care. Of course, you also need to make regular brushing, flossing, and dental procedures a part of your routine. Our expert team at Pickering Square Dental works to make getting professional dental care as pleasant and comfortable as possible. By combining oral care that takes advantage of the latest technology with a commitment to excellent patient service, we can help your teeth look their best for years to come. Learn more about our services and book your appointment with us today.